Kevin Kelly, president and COO, Stampede When it comes to technology, the pace of change occurs at a rate that far surpasses the pace experienced by almost every other product category in existence. In fact, it has been a long-standing tenet of technology companies that we “eat our young.” Nowhere is this more evident today than in the rapidly growing and constantly evolving category of unmanned aerial vehicles. 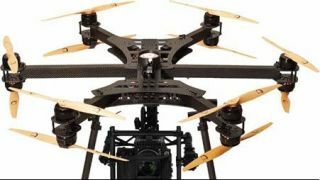 Less than three years ago, the InfoComm community as a whole barely acknowledged the existence of drones, let alone recognized their potential revenue-generating impact on the entire pro AV industry. Meanwhile, according to an estimate by the Federal Aviation Administration, sales of drones for commercial purposes are expected to grow from 600,000 in 2016 to 2.7 million by 2020. The growth of the commercial drone industry has already been exponential, and it will continue to be in years to come. If this isn’t a profitable opportunity for everyone involved at every level of this exciting industry, I don’t know what is. xFold rigs are some of the strongest and most advanced MultiRotors sUAV drone platforms for top level aerial work. There isn’t a vertical market in the pro AV industry today that is not being radically transformed by what these “miracle machines” can do. In fields as diverse as security, crowd control, education, construction, law enforcement, farming, real estate, first responders, mapping, and event planning, among many others, unmanned aerial vehicles are expanding business operations, reducing costs, improving safety, and creating new career opportunities at a pace matched by very few other industries. However, what began as a product innovation has evolved into a full-fledged systems integration revolution that is creating an entirely new revenue-generating ecosystem built around a UAV hardware platform. In fact, as will be evident at InfoComm 2016 in the Drone Pavilion, the UAV hardware platform is just the first in a series of purchase decisions that need to be made in order to define and implement a customized UAV system solution that can meet specific vertical market needs. Over the past few years, it has become apparent that the true potential of the commercial drone industry lies in complete drone-based solutions that incorporate add-ons, video, command and control capabilities, and educational programs with the drone hardware itself. The more that end-users familiarize themselves with the standard drone, the more they will want a complete solution built around it. For example, the first responder who requires a zero-millisecond video downlink to view drone-filmed footage in real time needs a completely different drone solution than the broadcaster who needs downloadable data storage for aerial photography. The solutions vary depending on application. The xFold Dragon is ideal for markets that required heavy payloads with long flight times. Thus, as AV technology evolves, so too do the capabilities of drones. In the commercial drone category, AV and unmanned aerial vehicle innovation go hand in hand. Products that transform capabilities on the ground can transform capabilities in the sky. Conversely, innovations in drone solutions add immense value to the commercial market. For example, XFLY recently introduced the all-new xNav IFCN, an intelligent flight control navigator designed to ensure total ease of flight, efficiency, reliability, and stability of UAVs in any situation. It’s equipped with AI decision-making capabilities and a self-teaching platform to safely operate a fleet from the ground. Commercial integrators can capitalize on this new solution by selling end users a means to control their drone fleet in the sky from the ground. Thus, commercial technology and drone technology are beginning to merge into a multifaceted ecosystem with nearly limitless possibilities for integrators and end users alike. There are more drone hardware manufacturers than ever before participating in the Drone Pavilion at this year’s InfoComm, but they will be joined by dozens of software companies, add-on attachment manufacturers, as well as training and education resource providers, that can create a full drone-based solution. At our booth, Stampede will be displaying an array of solutions from leading manufacturers such as DJI, AEE, Walkera, XFLY, FreeFly, Yuneec, Aerialtronics, and AeroFlight, alongside services and education from Unmanned Vehicle University and UA Solutions; command and control software from VideoBank, Smart C2, and Vidyo; and add-ons from Amimom and Agrowing. These multifaceted solutions don’t just give integrators an idea of what they can do with drones, they give them a pathway they can follow to implement a fully deployed solution that can meet the needs of any commercial vertical market. Drones hold the potential to completely transform life as we know it, and they are in the process of doing so. Going into InfoComm 2016, I challenge everyone coming to the pavilion to think beyond the drone. Think about the new ecosystem that is being built upon the drone platform. For system designers, integrators, and resellers in every vertical market, the sky really has become the limit of what can be achieved with these miracle machines. Kevin Kelly is the president and COO of Stampede.